On Thursday 22nd November, in a room filled with over 330 guests including 48 finalists across nine categories, charitable organisations, projects and individuals were recognised for their contribution to the conservation of wildlife and the natural environment. At the Sheraton Grand Hotel in Edinburgh, Rossie was acknowledged in the Youth and Education category for educational projects involving staff, young people and valued supporters of 6 years, Gillespie MacAndrew. Rossie instigated a number of inspiring projects which lead to a place on the shortlist for the Youth and Education Award. At the surprise of staff who attended the event, Rossie proudly claimed this award last Thursday night. Rossie’s CEO, Mary Geaney said: “As CEO I am proud and delighted Rossie has won this very prestigious National Award. It is formal recognition of the amazing work our young people and volunteers from Gillespie Macandrew are doing to conserve and protect the environment. Our wonderful woodlands also possess healing qualities and provide a therapeutic space for our young people to recover from some very traumatic and adverse childhood experiences. 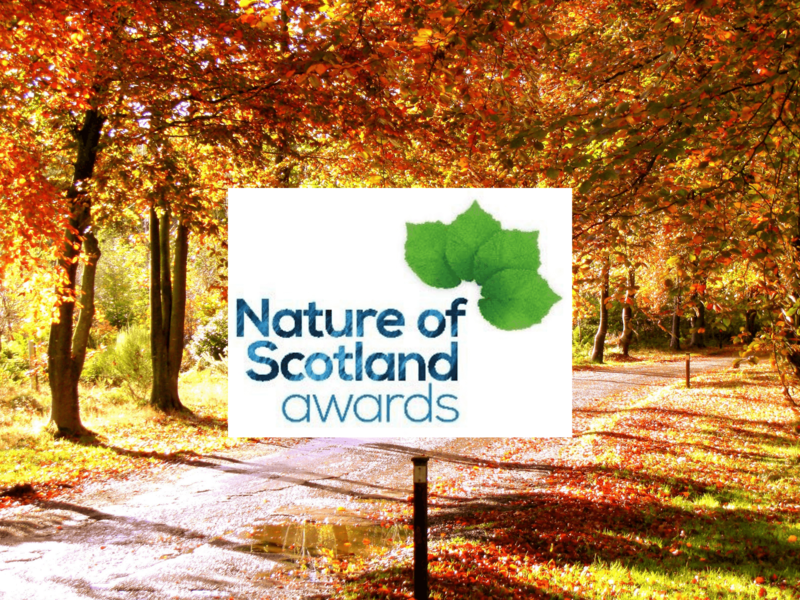 My sincere thanks to RSPB and Scottish Natural Heritage for acknowledging the individual and collective talent in our project ‘Reviving Rossie – Awakening a Secret Wood’. Rossie and Edinburgh law firm, Gillespie Macandrew connected in 2012 through Children in Scotland. After 6 years of dedicated volunteering at the Rossie grounds, the relationship is blooming. Craft and Design teacher, Ryan Ritchie, who has been heavily involved in the coordination of the projects said: “It was a fantastic evening and great to receive recognition for all the hard work put in by our young people and the Gillespie Macandrew volunteers. ‘Reviving Rossie – Awakening a Secret Wood’ is a compilation of projects aimed to enlighten hundreds of young people’s understanding, participation and appreciation of wildlife and its surroundings. A variety of woodland work was carried out by young people and volunteers including creating ponds, path networks, planting 1750 native trees and conducting flora and fauna surveys. Rossie’s ‘Grow Wild’ project (which started in April this year) has also set to construct a Willow Classroom, a Wildflower Meadow and a bridge walkway – all of which are in their final stages of building. The projects have inspired our young people to get involved – enabling them to put into practice what they have learned in the classroom in a fresh and nature-filled environment. Rossie continues to utilise the glorious surroundings by educating our young people about conservation of Scotland’s wildlife and natural environment.